IT MAY not take up the biggest space in the trophy cabinet but this 133-year-old cup kick-started Aston Villa's glorious trophy trail. After disappearing, turning up at the club and then gathering dust in a loft it has found its way back to the descendants of a Perry Barr man who scored Villa's first ever goal in the club's first ever game. The Lichfield-based Hughes family knew a relative had played for the club in the nineteenth century, but they only realised the full importance of the cup when internet searches confirmed that Jack Hughes was one of Villa's four founder members. The 'four founding fathers' of the club were Jack Hughes, Frederick Matthews, Walter Price and William Scattergood. The four cricketers organised a football match against Aston Brook St Mary's Rugby team as a way to stay fit during the winter break. The new Villa team managed to hold St Mary's to a draw up to half time and won the second half by one goal, which was scored by Jack. 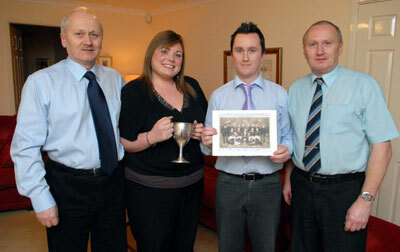 Jack's great nephews Robert and Stephen Hughes are now keepers of the historic cup after their father, Charles reclaimed it from the club in the 1980s. Robert, who lives in Lichfield, near to his brother in Cannock, said: "The cup had presumably been with family members and then somehow it turned up at the club, who then sent out an appeal to find Jack's family members. "My dad went over to prove that he was Jack's nephew using his birth certificate. To be honest, at that time, we had no idea that Jack was such an important person in the club's history. "We are Villa fans and we knew he had played for Aston Villa and that the cup existed, but the internet has played a big part in telling us that he was a founder member of the club and that the cup was awarded to him for scoring Villa's first ever goal. 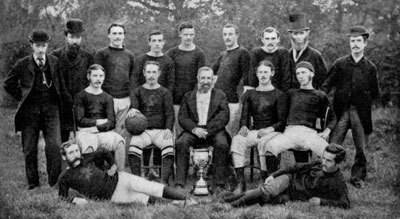 The four founders went on to play the modern version of football, and Villa won its first FA Cup in 1887. It was also one of the 12 teams that competed in the inaugural Football League a year later with one of the club's directors, William McGregor being the league's founder. Copyright and Trade Mark Notice © 2010 owned by or licensed to Trinity Mirror Midlands Limited. Birmingham Mail™ is a trade mark of Trinity Mirror Midlands Limited. Please read our Terms and Conditions and Privacy Statement before using this site.